This post is a day late, but I'm going to write it anyway. 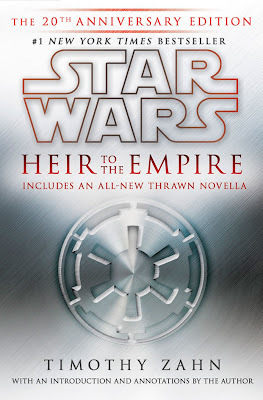 Yesterday, Del Rey Books released a 20th Anniversary Edition of Heir to the Empire, the bestselling Timothy Zahn novel that helped usher in a new era of Star Wars. Zahn's book brought Star Wars back to life. The trilogy's glory had faded in the years following Return of the Jedi. In those days, it was difficult to find any merchandise from that galaxy far, far away. I became a card-carrying member of the Lucasfilm Fan Club and eagerly anticipated the arrival of the Lucasfilm Fan Club Magazine, which featured stories about Star Wars and Indiana Jones. In 1994, that magazine would become the Star Wars Insider. The fan club mag was about the only way to get a Star Wars-themed t-shirt or any other officially-licensed merchandise (thank you, "Jawa Trader!"). So, really, the early 90's were a dark time for the Rebellion. Looking back, it felt like people had forgotten the trilogy. Sure, there were still plenty of kids quoting the movies and I watched them over and over and over and over again, but it didn't seem like anything "new" was coming down the pipeline. 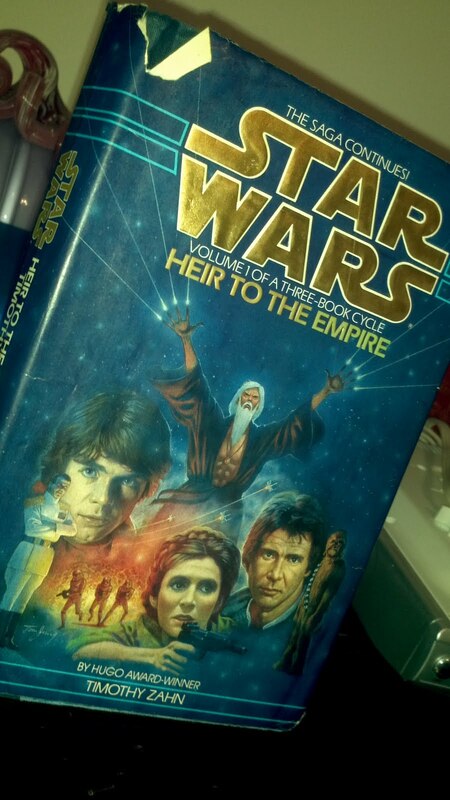 Then I read about Heir to the Empire. My mother asked Waldenbooks in Richmond, Indiana, to hold a copy for me. I can still remember going to the bookstore, the beautifully-illustrated cover all slick and shiny (cover artist: Tom Jung). This was a big boy's book intended for a slightly older audience with a higher reading level. Once, long ago, this book was in absolutely pristine condition. I rifled through that book. I distinctly remember reading it while eating Ruffles cheddar & sour cream chips. Over the years, the...ahem...proof of such snacky dalliances has all but disappeared. I loaned the book to my brother, who also read it. 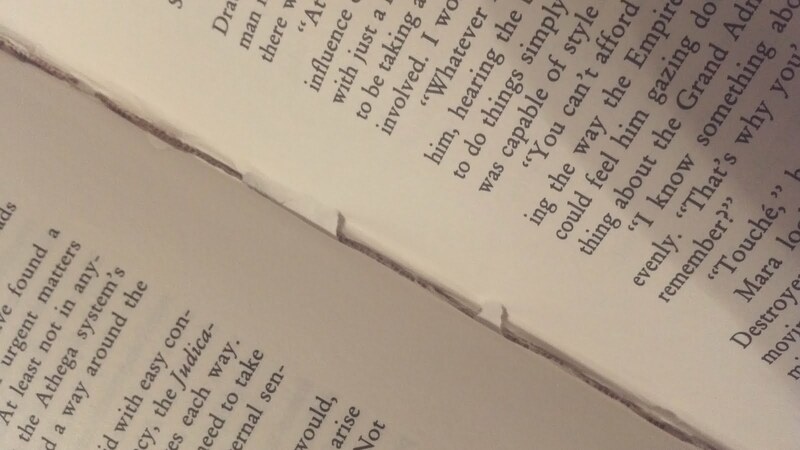 The book isn't falling apart, but you can definitely see the wear & tear from multiple readings over the last 20 years. My fifth-grade teacher, Mr. Bennett, had a unique reading program at school. After you read a book, he would then read it and write out a series of questions based on the book. This kept him connected to his students' reading habits and also served as a test of sorts to make sure you had indeed read what you'd claimed to read. 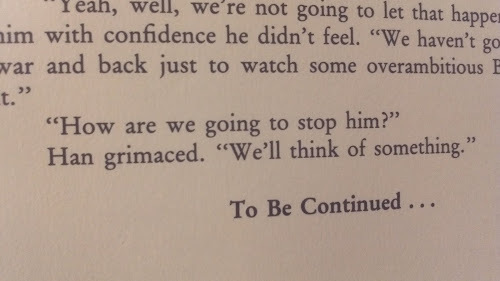 Poor Mr. Bennett had never seen a Star Wars movie. He was plunged into 360+ pages filled with backstory and references to past adventures he knew absolutely nothing about. Mr. Bennett was confused. So, perhaps a sign of things to come two decades later, I wrote the Star Wars dictionary, a quasi-alphabetical, crudely-illustrated directory explaining the history of key characters and events in the Star Wars universe. Mr. Bennett claims this helped. 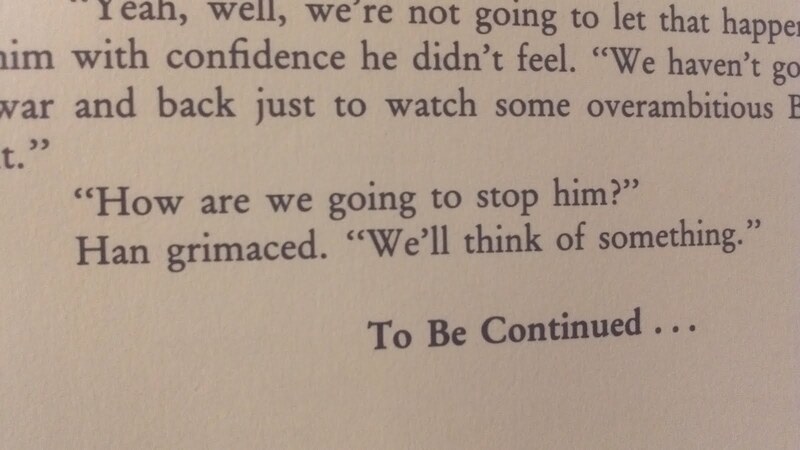 I subsequently blew his mind a few months later when I read the novelization of The Empire Strikes Back. 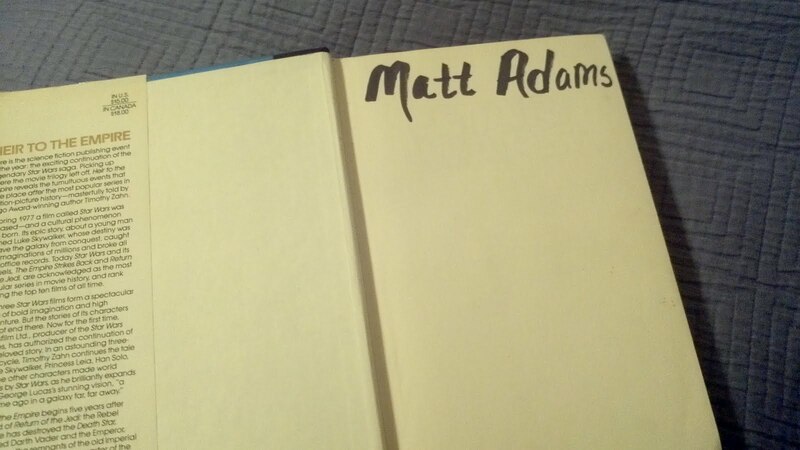 Awwww...little Matt marked his book. How cute. Flash-forward 20 years (20 years? REALLY? Let me reemphasize this: I remember picking the book up from the bookstore! How in God's name was that 20 years ago!??). Since the release of Zahn's book, there have been 3,720 "expanded universe" books. The original trilogy has been theatrically re-released (and will get a 3D rollout in the coming years). You can't go to the store without seeing the Star Wars logo plastered on something. The VHS format succumbed to DVD, which evolved to Blu-ray and streaming video (and there are, finally, home video editions of the trilogy available in all the physical formats). Jabba was added to the original Star Wars, we learned rather lamely that Greedo shot first (PUH-lease! ), and the Yub Yub song turned into something from Zamfir, Master of the Pan Flute. 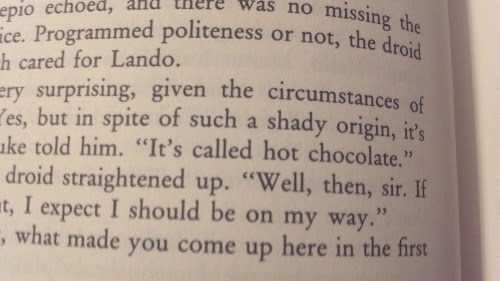 Zahn added hot chocolate to the Star Wars mythos. We'll take that over midichlorians, Mace Windu, Hayden Christensen, Naboo, The Most Awful Love Story Ever, and "Noooooooooooooooooooooooooooooooooooooo!" An avalanche of toys & collectibles followed, along with George Lucas' promised prequel trilogy that managed to ruffle a lot of feathers, demystify the Jedi and the Force, and made many fans wonder if the original trilogy (which wasn't really all that original anymore, thanks to high-tech tinkering) was kind of a fluke (I speak in generalities; this is a debate for another time). I wonder, though, if this would all have happened without Zahn's book, which I consider a true continuation of the movies. 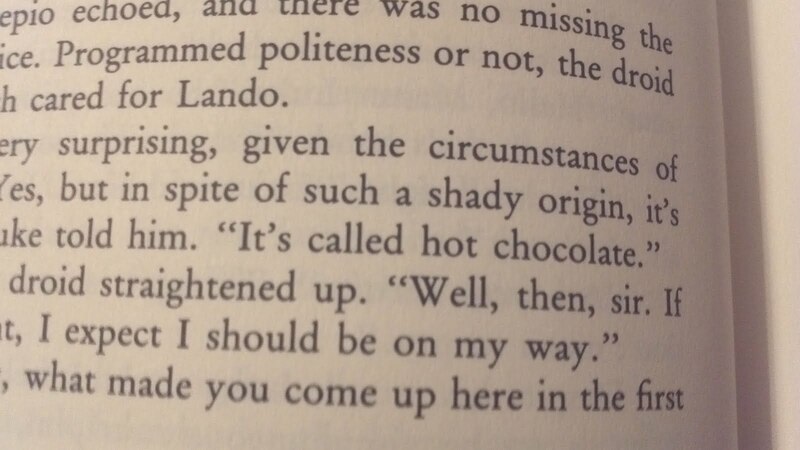 In his books (Heir to the Empire, Dark Force Rising, and The Last Command), our classic characters sounded and acted like themselves. The Empire, though flagging, remained an ever-present threat. And the cloning technology so clinically boring in the prequel trilogy seemed somehow more sinister. Without Zahn's book, would Star Wars have enjoyed the early-90's resurgence that continues to this day? I don't have the answer to that. 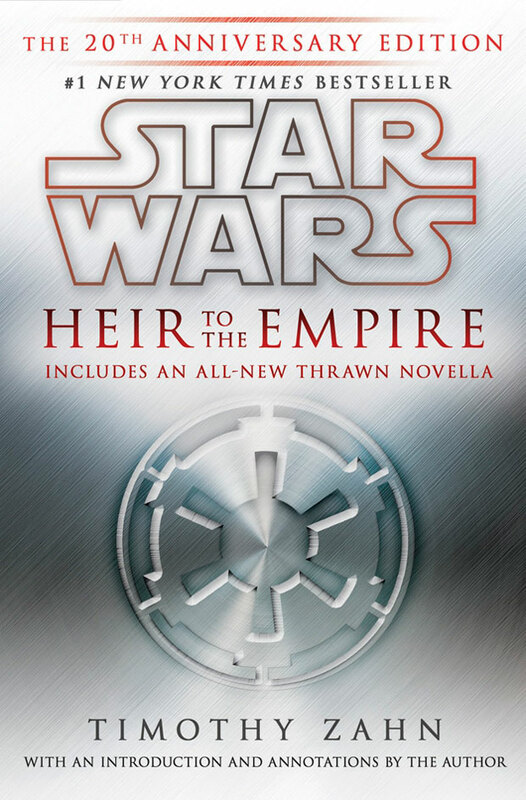 I do know, however, that it's time to dust off Heir to the Empire and read it once more. Not everything has to be read on a Kindle, ya know. Hey, Bro! Thanks for letting me borrow the Zahn series 20 (gulp!) years ago. Personally, I'd rather seen Lucas make these movies than the prequel. Especially now that I've seen the prequel. It only took Episodes 2 & 3 to ruin a perfectly great performance by Liam Neeson, by the way. Actually, it only took about 30 minutes of Episode 2. Sigh.